It has been 7 weeks since my last opera trip as a virus forced to cancel plans during February, but the performance in Munich gave me an unexpected reward and even more: such emotional fulfilment and happiness that it is still difficult to put the impressions in writing. The production of Andrea Chénier by Umberto Giordani was long awaited premiere in Munich, and many opera enthusiasts were looking forward to the new hit of local dream duo of Anja Harteros and Jonas Kaufmann. In fact, seeing Anja Harteros as Elisabeth de Valois in “Don Carlo” in Berlin gave the start for my opera exploration adventure. Thus, knowing that Philipp Stölzl will direct and design sets for the new production, after seeing his Faust at Deutsche Oper Berlin and innovative approach to Cavalleria Rusticana/ Pagliacci in Salzburg, the event became even more desirable, the “must see” of the season. Unfortunately, my first attempt at ticket advance order failed, and I almost gave up and was ready to wait till Munich Opera Festival. Then, incidentally, on a cue from a Twitter friend, I checked the website and grabbed the only available returned ticket at a heartwrenching price, to be seated in the middle of row 6. The concept used by Philipp Stölzl somehow resembled approach used at Cav/Pag, dividing the stage into small sectors and creating multiple stages at once where a lot of parallel activity was going on – very cinematic, spectacular and dynamic environment. The costumes and lights were supporting the concept firmly through numerous details, as well as was involvement of many extras as the people of lower classes, the force driving the revolution. The surprising sophistication of the stage props, which were moved without any annoying sounds and let us marvel at depth and size of the offstage area at the Nationaltheater. Thus, it was highly well thought, conceptual, intelligent and visually enjoyable production, – wondering why it received boos on the night of the premiere. The star duo of Anja Harteros and Jonas Kaufmann delivered dramatically fulfilled and vocally impeccable evening. All the concerns about Kaufmann singing with “handbrake on” were indisputably shattered as the voice was soaring into auditorium freely, easily cutting through the dynamic and energetic orchestra, masterfully led by Omer Meir Wellber. Each solo aria either by Jonas or Anja received a roaring and lengthy ovation, as also their duets kept the audience fully mesmerised, especially Ora soave, sublime ora d’amore! of Act 2 and Vicino a te s’acquesta of Act 4. At the end of the performance, the audience expressed their admiration not only with rapturous applause and standing ovation but with their feet. Anja as Maddalena de Coigny created full-bodied heroine, from naive and girlish young aristocrat to strong willed, passionate women towards the end of the opera. Her La mamma morta made the audience breathless, and it was one of the most fabulous interpretations of the aria I have ever heard. Her artistic capability and vocal skill is worth to overcome any travel hurdles or cancellation risks – she undoubtfully is one of the divas of our era. 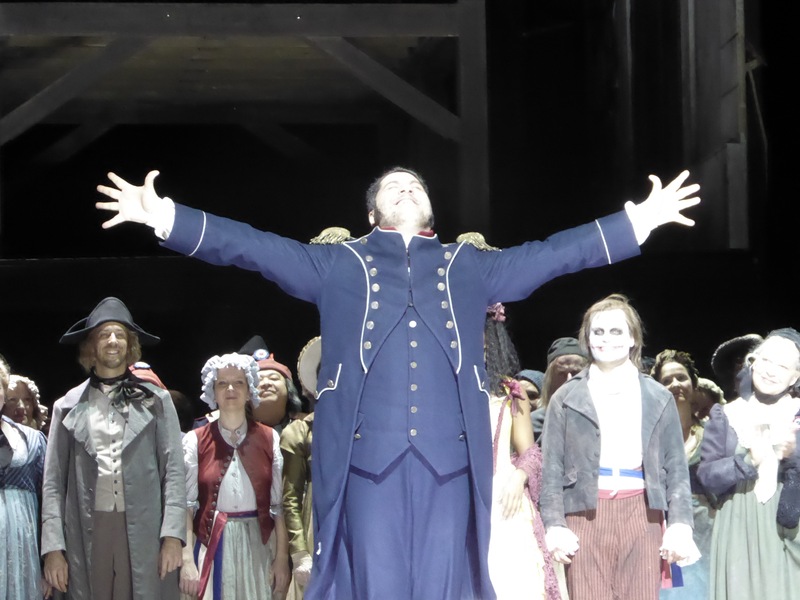 Jonas as Andrea Chenier embodies the voice of revolution and even if thus becomes the sacrifice for it – reciting Danton – revolution eats its children. His hero is an outsider from the first appearance to the unavoidable end – either by distinctive dress or observing cheering crowds, or studying and writing in solitude. His confrontation with Gerard does not seem antagonistic, they are both overwhelmed by the passage of events. Kaufmann painted the character with an extensive palette of dramatic and vocal means, ranging from tender piano to full throttle volume projected as the wall of sound supported by his advanced acting skills. There was a fleeting feeling that parts of the score delivered from secluded areas were partially muted by the sets, but it might have been an acoustic appearance at the centre of parterre. Luca Salsi gradually becomes one of the most interesting baritones of the generation. It seems I have established a tradition to attend his birthday performances – like last year at La Scala for I due Foscari. During the year he has added stage experience and confidence which results in much higher gravitas, and now I am keenly looking forward to seeing him in Salzburg in August. Luca Salsi creates the character of Carlo Gérard who has both ambition and a vision while his humanity dominates over demands of social status. His performance of Nemico della patria received thunderous, prolonged ovation which was well earned, and the acting has been consistent with the character’s development and convincing throughout the night. 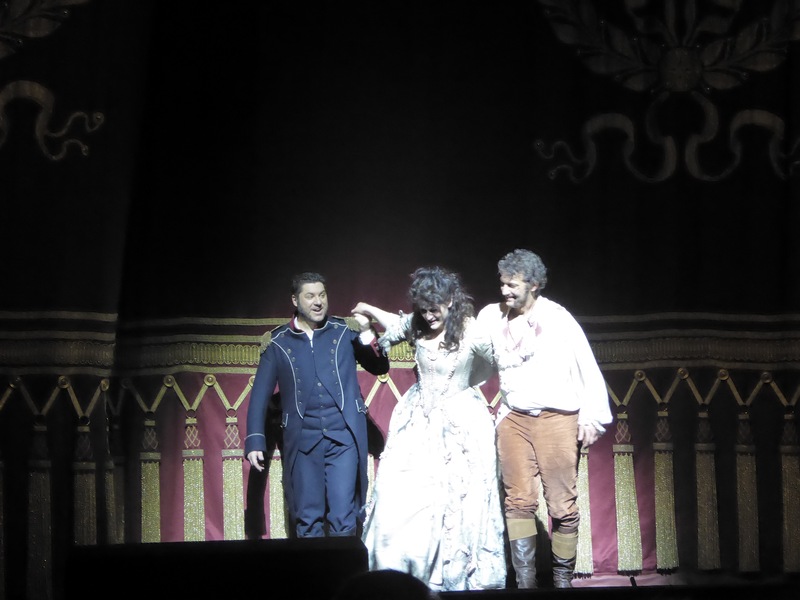 The funny moment Salsi created during repeated curtain call – signalling to the audience that he is very tired and hungry – and receiving more cheers and laughter from remaining enthusiasts. Doris Soffel as La comtesse di Coigny had relatively short but important role in the Act 1, which was delivered with finesse and grace. From staging perspective, the verbatim illustration of the death of the beloved mother during signature aria La mamma morta was a bit disturbing in its naturality. Doris Soffel demonstrated her advanced acting skills and great immersion in the role. Elena Zilio as Madelon, an old woman, had only one signature aria Son la vecchia which was so well acted and sung that audience could not keep their calm either at the end of it or at the curtain calls, proving that outstanding acting skills are crucial for the opera singer. Before the trip to Munich I have received confirmation and ticket for Munich Opera Festival, which includes also a ticket for the last performance of Andrea Chenier this season. Until Saturday, I was considering to offer this ticket to someone who would like to attend the performance instead. Not anymore. This production requires at least another viewing, – as after discussion with another opera aficionado, who had seen all three performances – it is like a living creature -improving each time. I will be there again on July 31st ready for re-discovering the French Revolution again. Next Post: The tale of two queens in the eternal city. Maria Stuarda, Donizetti, Rome. I am green with envy but thrilled by your review….